Navarathri is a very interesting festival and celebrated during the month of Purattasi. North Indians Celebrate this Festival as Dasara. We make lot of friends during this festival especially, when we move to a new locality. Women celebrate this occasion with a great level of devotion to goddess. The most interesting part of this festival is the golu decorated with lot of dolls depicting historical events, idols of god, themes such as marriage, cricket, park etc; This also depicts our culture. In my In-laws family we do not have the practice of golu. 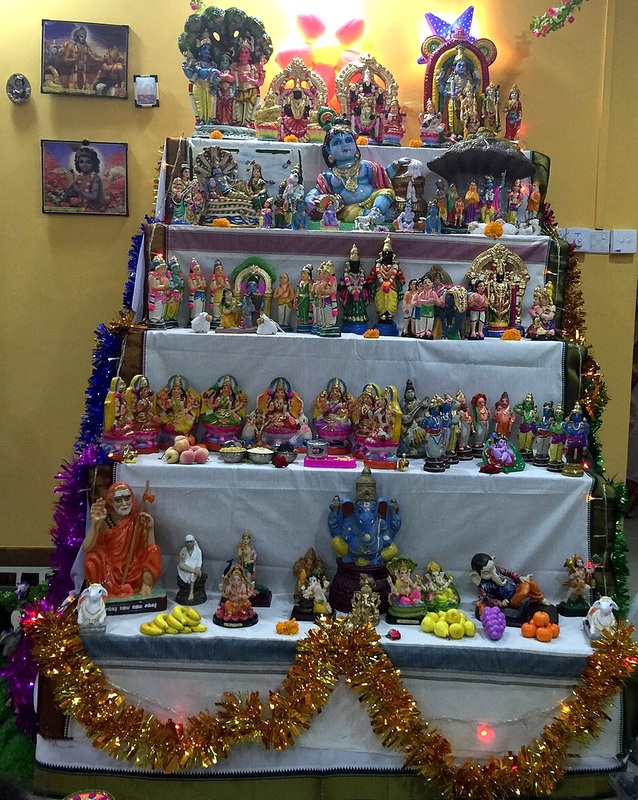 The picture of golu was shared by Krithika. Women perform Pooja on all 9 days of the festival. Each day has one significance. People also conduct Parayanam of Lalitha Sahasranamam, Durga Sahasranamam during this period. Women also undergo fasting and the food is no onion no garlic on all 9 days. The day we prepare for Navarathri is on the day of Amavasai in the month of Purattasi. People start setting the steps to place the idols and golu. 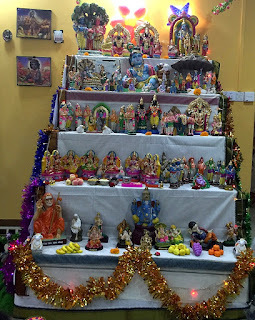 This year Purattasi Amavasai fals on 30 Sep and we have to start with our work on that day and could finish the decorations by end of day or by next day. Day 1 of Navarathri falls on 2 Oct and ends on 10 Oct which we celebrate as Saraswathi Poojai. The next day is Vijayadasami. The first item is the Kalasam that is prepared and kept in Golu. The next idol would be Vinayagar followed by other idols of god. The idols of Gurus are kept beneath the idols of god. The Kalasam is not kept in few families. The number of steps is usually in odd numbers. Few people used to place the Amman Mugam we use for Varalakshmi nonbu. Ashtalakshmi set, Dhasavadharam set, Marappachi Bommai, Chettiar Bommai with Shops are few commonly known and sort of must for the golu. One of my friends follow themes for each Navarathri festival which is quite interesting. Every year we ensure to buy at least one new Idol for the Golu. Idols that are used by our grand parents form a very significant place in the golu. The Dhasavadharam set should be arranged in the proper order which is usually a challenging one. The order goes like this. Special lighting's are used to decorate the golu. On all evenings guests are invited to our homes to get the blessings of goddess and to receive Manjal kumkum. We prepare one variety of sundal every day to offer to offer to goddess and to issue to guests. Ellu Podi (Seasame Podi) is prepared on Saturday and Puttu on Friday for offering. Sweets are also prepared daily in the morning as offering to goddess at the end of Pooja. Make use of Jeyashri's kitchen recipes to celebrate Navarathri with awesome sweets and sundal. Offering dress and Manjal Kumkum to young girls who is yet to attain Puberty is considered as very auspicious during these 9 days. Nowadays people started providing gifts that includes small bags, purse, blouse bits etc; of their choice. The small girls in the families are enthusiastically involved to invite the neighbors. They wear silk skirts, dress traditionally and take a small box of kumkum to offer and invite the neighbors. During my child hood days myself and my sister prepare in advance for the park since few greens are required to make it more realistic. We grow small tiny plants few days in advance and place it for the park. Small pool is also used in the park. We used to draw colorful kolams in my house to decorate and to invite everyone's attention. Golu competitions are also conducted to encourage the participation. Songs on Goddess also add flavor and sung by kids, women and invitees of golu. Every day in the night after issuing Manjal kumkum to the invitees we take Aarthi to end the day's event. Very beautifully written post about Navarathri golu. Great job Mythili!